Since I started writing about trains, some fifteen years ago, I've answered lots of questions about appropriate power supplies for different kinds of trains or installations. But it's only in the last few years that I realized I was making inaccurate assumptions about our readers' exposure to basic electrical principles. I literally grew up with electric trains of all kinds. Plus, we used to build simple electric circuits in our junior high science classes, so I had a pretty good idea of how most simple electrical devices worked. Now several contacts from readers remind me that today's middle school students are studying nuclear science and biochemistry instead of the subjects I studied back in Middle Earth, er, Middle School. So here's a primer, or a refresher, for anyone who's a bit rusty on some of the basics, paying special attention to the kinds of electricity and equipment used by track-powered electric trains. My electrical engineer friends would probably freak out if they saw my overly-simplified block diagrams or some of the ways I explain things. But these are the principles, and "rules of thumb" that work for me and for many experienced model railroaders and garden railroaders. We will be using two terms that describe ways of "measuring" the electricity, or of measuring a circuit's ability to carry electricity. Voltage measures the amount of electrical force in a current. Amperage measures the rate of flow of current in a circuit. It helps some folks to compare electricity to water in a hose. Voltage behaves something like water pressure. With a pencil-sized hose and plenty of water pressure, you can create a blast of water that will drill a hole in concrete, but it will take a long time to fill your bathtub. A wider hose is wanted for that job. This sort of "capacity" issue, when you're talking about electricity, is measured by amperage. Higher voltages can "push" electricity farther against more resistance. That's why (in North America) your house wiring carries 120 volts instead of 12v or 24v. 120v will "push" enough energy throughout your house to drive a refrigerator at one end and a hair dryer at the other, something that lower voltages will not do - the resistance of long copper wires would cause the effective voltage to drop below usefulness. The relationship between voltage and resistance can be illustrated by the picture to the right. 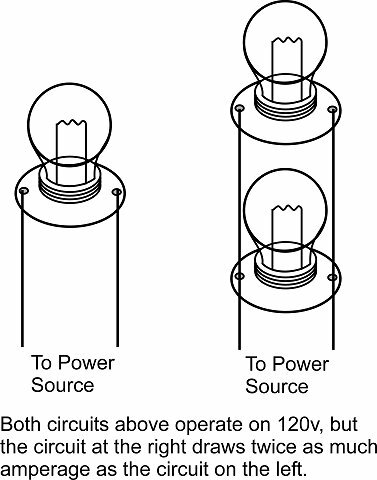 If you take light bulbs that are made to glow brightly when receiving 120v current, then wire them so that the current has to pass through two of them, the resistance of the circuit is doubled. As a result, each bulb is only getting 60v and will barely glow. On the other hand, once voltage overcomes the resistance of a circuit, the capacity of that circuit affects how much amperage can come through. For the sake of argument, lets say these are 120-watt bulbs, each of which draws one amp. 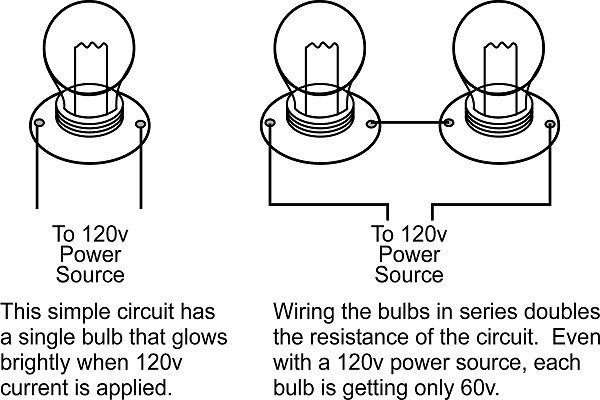 If you wire the bulbs in parallel, such as the circuit to the right, the voltage stays the same, but you have doubled the capacity of that circuit from one amp to two amps. In a model railroad, you may have one locomotive that draws 1/2 amp while pulling ten cars. If you add another identical locomotive to the same train (called a double-header), your train is going to draw 1 amp, as long as your power supply can produce one amp at the rated voltage. Or if you add more cars and make the single engine work harder, that will draw more amperage. So will replacing your locomotive with a bigger one that has a bigger motor. Unlike house wiring, where you can usually count on, say, 20 amps driving each circuit, most power supplies that come with train sets provide one amp or less, so when you start upgrading trains, you will need to consider upgrading your power supply. 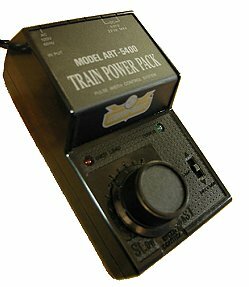 Obviously smaller scales require less power - a two amp power supply may be all you need for a substantial N or HO railroad, but it may be a starting point for a garden railroad. If you multiply the voltage in a circuit times the amperage it will draw, you get the "wattage" of the circuit. So a microwave that runs on 120 volts and draws 10 amps will be labeled "1200 watts." Knowing the wattage of a 120v appliance helps you determine whether it will cost you a lot to operate, or whether it is safe on less-than-optimum circuits. On the the other hand wattage ratings don't mean that much when you're talking about electric train power supplies. Yes, power supplies for model trains usually have a wattage figure printed on them. But that figure refers only to how much 120v power they draw from your house wiring. It does not indicate how much 18v power is getting to the track. When we're talking about low voltages (like 18v) we generally find it more useful to think in terms of voltage and amperage, and leave the "wattage" discussion on the "house wiring" side of things. We use 120-volt power in our walls because the voltage is high enough to drive current throughout the house, and low enough to be safe as long as the wires are not exposed. But toy or model train "wiring" is exposed by default - that is, the current is carried through metal rails only an inch or so apart. So if you used 120 volt power to drive your electric trains, the chance of someone getting a painful shock, and maybe even a burn or worse would be pretty good. (The danger would be even greater in countries where 240v house current is the norm.) So toy and model trains use a much lower voltage, usually about 18 volts (though some go as low as 9v or as high as 24v). Now there are several ways to reduce the voltage of a circuit. As we discussed above, we can reduce voltage by increasing the circuit's resistance. But that wastes power and generates unwanted heat. Most low-voltage electrical products use transformers to step down the voltage. Transformers use an electrical property called induction - if you send electricity through a coil and put that coil next to another coil, a stream of current will be generated in the adjacent coil. The drawing to the right shows a simple transformer based on that principle. Because the coil connected to the input power source has more loops than the one connected to the output source, the voltage on the output source will be lower. This is an oversimplification, of course - many transformers have thirty or more loops per coil. One-piece power supplies for electric trains have transformers. Most of these take 120v "house current" and output 18v (or so) of low voltage current. The symbol for a transformer in an electrical diagram is shown to the right. In this case, the two bars in the middle represent the iron core, a common feature. 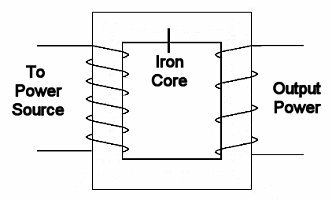 The iron core and the copper coils are what make transformers relatively heavy. A transformer that is capable of handling high amperage will use thicker wires for its coils, adding even more weight. Now that we've reduced our voltage to safe levels, we still need a way to make our trains go faster and slower. Otherwise, your train would take off at full speed as soon as you turned your power supply on. Remember what we said about using resistance to decrease voltage? Here's where that really comes in. 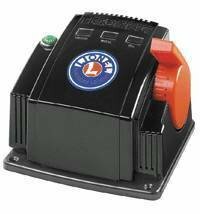 A rheostat provides variable resistance that allows you to change the voltage actually getting through to the tracks simply by turning a knob. The "heart" of a rheostat is a "wiper" that slides across some conductive material, moving from less to greater resistance as it goes. In the rheostat shown at the right, copper coils are used to create resistance. 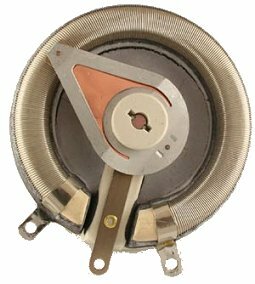 At one end of the rheostat's range, electricity must travel only through one loop of the coil to get to the wiper. At the other end of the range, electricity must travel through every loop of the coil. Cheaper rheostats use a specially designed copper strip instead. Using the example of an 18v power supply, you would first make certain that any train you use will handle at least 18 volts. Then when you "start the train," you are going from 1v to 2v to 3v, etc. as you turn the knob up. Some trains won't run at all on less than 6 volts; others will begin to creep along at lower voltage. That's the "beauty" of a rheostat - you can watch the train as you twiddle the dial to set the speed you want. The symbol for a rheostat is shown to the right. Note: Most power supplies have other components that are not shown, including circuit breakers or fuses - we are only showing the critical components in these illustrations, to give you an idea of the overall workings of the things. Several AC power supplies are shown below. These are examples of the power supplies made for Marx, Lionel, and American Flyer trains. They are also examples of what NOT to use with garden trains or HO, N, or On30 trains, unless you like the smell of DC engines burning up. Most house current in North America changes polarity 60 times a second, which we call alternating current, or AC. Most early electric trains worked fine on AC, as long as the voltage was stepped down. However virtually all Large Scale (Garden) trains, HO, On30, and N gauge trains require direct current (DC) to run. (In DC current, electricity always goes the same direction - positive is always positive and negative is always negative.) In fact, AC current will burn out most model train engines. Fortunately, the circuits required to convert AC to DC are fairly simple. The earliest designs used four components called diodes that were hooked together in such a way that AC electricity could flow into the circuit but only DC would flow out. The electronic symbol for a diode is shown to the right. The arrow shape indicates that electricity coming that direction will get through the device. The vertical bar indicates that electricity coming from that direction will NOT get through the device. If you put just one of these into a circuit, it would allow every other phase of the AC current to go through - but that would mean that the electricity would be going on and off 30 times a second. Some very cheap power adapters for toys or reading lamps used to use this shortcut. On the other hand, more demanding and sensitive devices need a steadier source of power. The picture to the right shows the basic principle of a "bridge rectifier," that is, a circuit that converts both phases of AC into DC power. If you want to trace the circuits in the picture, you'll see quickly that no matter which way electricity flows into the circuit from the AC side, it HAS to flow out through the positive side of the DC circuit. So both phases of the AC are rectified. Modern rectifiers usually look like a little box with four wires coming out, or like IC chips, but the principle is usually the same. The graphic to the right shows one symbol that is commonly used to represent bridge rectifiers in circuits. The following diagram shows the major components of a DC power supply - transformer, rectifier, and rheostat. It doesn't show minor components like fuses, filters, and a switch for reversing the flow of DC (to reverse the trains' direction - see below). 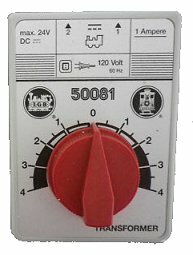 Most DC power supplies for model railroads also have a low-voltage AC line that bypasses the rectifier, so that low-voltage AC is available for accessories. Lamps can run on AC, but most switch motors (for powering turnouts) MUST run on AC. Just be certain you don't hook the AC line up to the track. 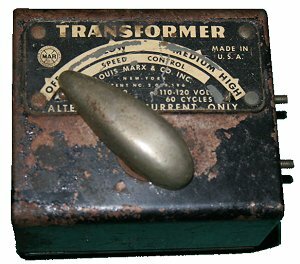 Lionel and American Flyer users tend to call their power supplies "transformers" because that was the most important part. 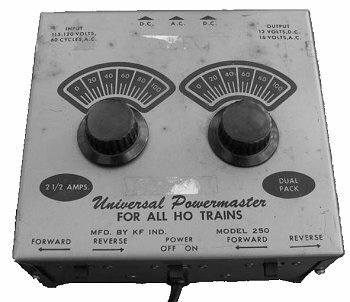 When HO and other models that required DC power came along, model railroaders took to calling their power suppliers "rectifiers," because they contained this critical element that was NOT included in earlier power supplies. So the word rectifier can mean EITHER the little "bridge rectifier" circuit I described above, OR a power supply that includes this circuit - hope that's not TOO confusing. By now you've probably figured out that if your train is going a certain direction, and you pick it up and turn it around without changing the direction of the voltage, the train will continue to go the same direction, only backwards. That's because the direction of the current, not the direction of the locomotive, controls which way the train goes. Most model railroaders get used to this in a hurry. Here's something else to think about: most garden trains are wired "backwards" from most indoor DC-powered trains. So if you have a big, honking indoor power supply that you try to use outdoors, the trains will run the opposite way that you think they "should." This is a convention that LGB started in the 1960s, and most garden railroaders are used to it, so it's not a problem unless that sort of thing really freaks you out. A few high-end garden locomotives even have switches you can use to "fix" this problem if it bothers you. Return Loop Heads-Up - The only place where changing directions gets complicated on DC-powered railroads is when you have a "return loop" that brings your train back around to the mainline that it was on, but going another direction. That is very easy on 3-rail setups, but pretty complicated on 2-rail DC setups. Unfortunately that subject is beyond the scope of this article, except to say, you'll probably need to buy a special device to solve this "problem" if you've designed it into your railroad. Within the world of modern power supplies, there are some notable variations that affect train operation. Pulse Width Power - One variation is AristoCraft's "Pulse Width Power." Instead of simply starting with a very low voltage and going up as you turn the knob, Aristo power suppliers actually send "pulses" of DC power to the locomotive. As you turn the knob up, the pulses get longer and closer together. The train still starts up slowly (in fact, the "inertia circuit" - another feature - makes sure of that). But the train will generally run a bit more reliably at lower speeds (since nearly full voltage is getting to the train with every pulse). In the meantime, sound systems, smoke systems, and lighting systems all work much better at low speeds than they would with traditional rheostat-only control. The ONE caveat is that this system will chew up any Lionel's "RailSounds" sound systems, but since those haven't been made since the 1990s, you're probably safe. A few vendors used to offer something called "Pulse Power" that attempted to perform similar functions by mixing in a bit of AC power at the low end of the power settings, but that doesn't seem "healthy" for a DC motor. I'm not aware of anyone offering "pulse power" in their power supplies today, but if you come across an older power supply that offers "pulse power," you might want to avoid it. Digital Voltage Control Technologies - With the rise of remote control technologies, direction and speed functions have been taken over by an electronic device that controls how much voltage gets to the train engine. So your train set may not have a visible "knob" at all. But trust me, your setup DOES have a circuit that performs the same function as a rheostat somewhere. Although a transformer by itself will step your voltage down to safe levels, transformer output may drop below rated voltage as the circuit approaches capacity. So an 18v power supply might only produce 16v when you load it down. Some of Lionel's biggest AC train power supplies get around that by making big, honking transformers that are likely to handle anything you put on the track. Several of the better quality DC power supplies use transformers that actually produce a slightly higher voltage than the rated capacity, then use a voltage regulator to bring the output voltage down to the rated amount. 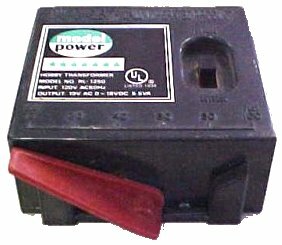 For example, a transformer for an 18 volt power supply may actually produce 22 volts, then a voltage regulator brings the voltage down to 18. As the circuit approaches capacity, the transformer may drop down to 18 volts output, but that's fine - the voltage regulator still allows all of that voltage through. In a sense, a "regulated" power supply has a built in "margin" to help maintain its rated output even under stress. I won't go into how voltage regulators work, except to say that this is one reason two otherwise identical power supplies may behave quite differently under a heavy load. The symbol for a voltage regulator is shown at the right. As the block diagram below shows, the voltage regulator is usually placed after the rectifier but before the rheostat. In real-world examples, however, almost no single-unit power supplies contain voltage regulators. That feature is usually reserved for two-piece units, described below. The following illustrations show a selection of one-piece DC power supplies for indoor DC-powered trains (HO, N, On30, etc.). The first two are examples of "aftermarket" supplies that someone with a large indoor railroad might add to his setup. 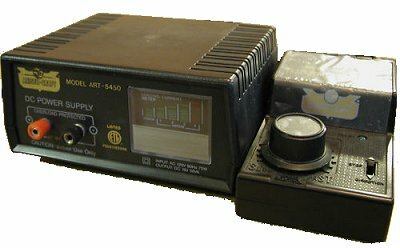 The Model Power supply is an example of the kind of power supply that typically comes with a train set. Though they look quite different, all three share the same components shown in the "Simple DC Power Supply with AC Accessory Output" drawing above (though the dual-control power supply has two rheostats, of course). Outdoor trains draw more power; some may draw much more power, so 1-2-amp power supplies are considered the minimum and 5-10 amp power supplies are common on large garden railroads. Outdoor use requires different materials used - many aftermarket "indoor" power supplies would drive garden trains just fine, but they rust and corrode quickly since they aren't built to handle damp weather. 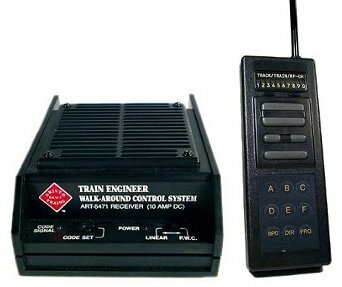 Also, outdoor trains run "backwards" when you put them on power supplies built for indoors, but most people figure out how to use the "reverse" button to solve that "problem." The LGB example below is very similar to the examples above, and contains the same basic components as the drawing. 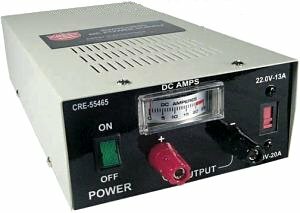 The AristoCraft 5401 fulfills similar functions, but it includes other features, such as "inertia" and "pulse power" technology that the other power supplies don't have. By the way, I have several of these, and they run every brand of train substantially better than the power supplies that come in the train set. The only thing they shouldn't be used with are the old track-powered Lionel GP unit and the Lionel PRR Atlantic with RailSounds. All three units above have actually been discontinued, but the LGB and AristoCraft units are still available used in good condition. Both LGB and Bachmann have gone to two-piece solutions (LGB's is shown below). AristoCraft's starter sets now use remote control technologies that replace the "rheostat" functions (though there is still a transformer that plugs into the wall). It's also worth noting that NOT ONE garden train power supply is actually designed to be left out in the rain. Go figure. Many garden train operators whose railroads outgrow the little power supply that came with their starter set migrate towards a similar two-piece solution. Such sets usually have the transformer and rectifier in a single "regulated" power supply (see above), then they use a separate rectifier unit. The following diagram shows a two-piece DC power supply without a voltage regulator. This kind of setup is now found in LGB and PIKO starter sets, as well as several others. 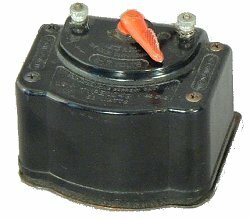 I have labeled the part that holds the rheostat a "controller" since more and more features are finding their way to that part of the system. The following pictures are examples of two-piece DC power supplies that are now included with some train sets, especially garden train starter sets. These LGB and Bachmann power supply setups represent the growing trend toward indoor two-piece solutions, especially in garden (Large Scale) train starter sets. The transformer and rectifier are in the little black "wall wart." The rheostat (speed control) and DPDT switch (direction control) is contained in a separate unit. A similar setups is also provided in Piko's Large Scale sets. The following diagram shows a two-piece DC power supply with a voltage regulator. This is more common in higher-capacity, after-market systems, with power supplies up to 10 amps and controllers that can handle 5 amps or more. The AristoCraft/Crest set above shows a more powerful and flexible solution than the train set systems shown above. 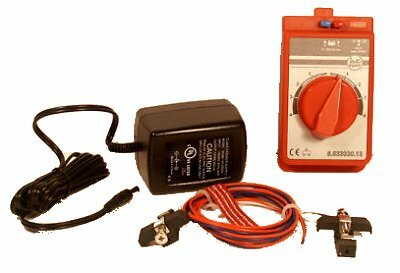 It includes a regulated 3 amp power supply (#55450) and a separate control unit (#55401) that contains the rheostat, inertia, and pulse power circuits. A solution like this allows you to keep your transformer/rectifier away from the railroad, even indoors, and just have the controller trackside. This exact solution is discontinued, because AristoCraft/Crest products now have remote-controled features that replace the functions of the controller unit. But I have two of these setups, plus one with a 10 amp power supply, and find that they are extremely reliable and easy to work with. 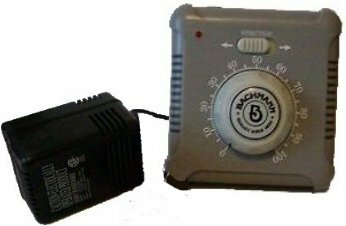 As an alternative to the controller shown above, LGB has occasionally offered a unique rheostat, #52120, which is meant to be left outdoors. The theory is that you have a power supply (up to 5 amps) in your garage or some such, but only the low-voltage DC current comes out to the railroad. If you can use such a solution (say your railroad is next to your garage), this both increases safety and decreases setup hassles. Most users recommend covering the controller when it is not in use, but it is no trouble to take a plastic bag or inverted bucket off the unit when you're ready to run trains. 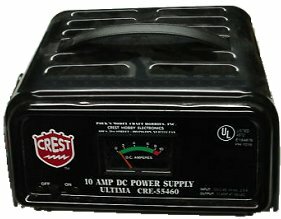 By now you may be wondering why you can't get a controller unit like the AristoCraft/Crest #55401 or the LGB #52120, and come up with an 18 volt power supply from somewhere else. The answer is, there is no reason, as long as you choose the power supply carefully. Find out what the maximum voltage rating of your average train is, usually 18v for the larger scales, though a few handle up to 24v. Then look for a filtered, regulated power supply that will produce at least three amps (ten is better). 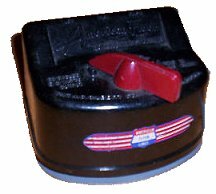 In my case, I've had great luck getting slightly used discontinued AristoCraft/Crest units like the 5450 (above) and its 10-amp big brother, the 55460. The latest and greatest version is the Crest 55465 Elite Dual Voltage "Switching" Power Supply. "Switching" technology replaces the heavy transformer with light-weight electronics, but this power supply otherwise functions like any other equally-rated power supply, and better than many with the same official ratings. As the above descriptions implied, controllers are gradually gaining more features. Some, like the LGB #52120 have rectifiers built in, which allows you to use power supplies that produce low-voltage AC current. As an example, a few folks have experimented with using Lionel's big aftermarket ZW transformers with the LGB #52120. It works, but you're paying for features you won't be using, like rheostats that you'll leave turned up most or all of the way all of the time. Plus, Lionel transformers are not designed to withstand even moderate exposure to the weather. And, in my case, I'm not comfortable with ANY AC power getting near my DC trains; yes I'm probably paranoid, but human error happens (especially in my back yard). 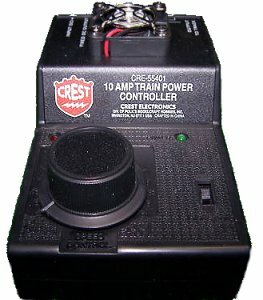 The best wired controller ever made may be the ten-amp AristoCraft/Crest 55401. This controller can handle up to ten amps, enough for some very large trains with multiple locomotives. It also has pulse width power (described above) and "inertia," so that the trains start up and stop in a realistic manner. 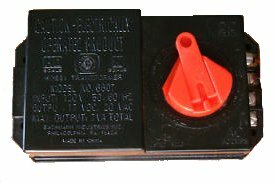 A remote control unit sends signals to the electronic controller. The three most popular versions of this sort of setup are all made by AristoCraft/Crest. On the left is the original AristoCraft Train Engineer System (later labeled the Crest 55470 system). It includes the track controller (#5471 or #55471 on later versions) and a programmable hand-held remote control (#5473 or #55473 on later versions). This system went through multiple upgrades. It has now been discontinued in favor of the Revolution TE (shown at the right). However, units are still available, especially on the used market. One remote will control several track controllers. It can also drive "receivers" mounted right in the locomotive for individual remote control ("cab control") if you wish, but that's beyond the scope of this article. In the middle is the AristoCraft Basic Train Engineer System that is now provided in most AristoCraft starter sets. The power supply from the starter sets is actually a little black "wall wart" like the power supply for a computer accessory, but it provides enough power to drive anybody's starter sets. 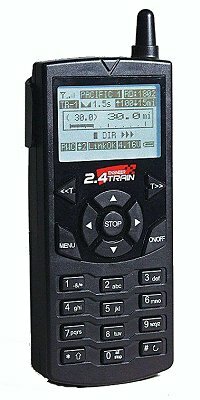 The remote uses a Walkie Talkie frequency, so it is more prone to interference than the bigger TE and Revolution units, but it's fine for small railroads indoors or out. You use the handheld remote control to set speed and direction. The trackside controller sends pulse-width power to the track according to the speed and direction you choose. An additional feature of this solution is that this setup controls ANY train (of any brand) that you put on this track. And if you choose the Revolution, you can also choose to add individual (cab) control to your locomotives later just by adding receivers - a simple job on Aristo's better locomotives. 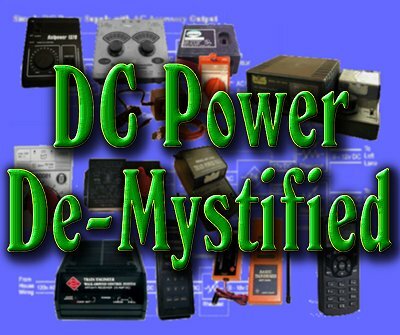 As you have figured out by now, you have a wide range of choices for DC power. 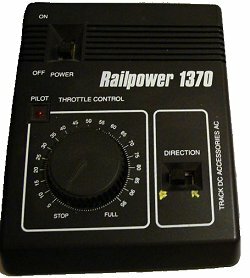 Small railroads, especially small indoor railroads will generally work fine with the power supply that came with your first train set, especially if it is over one amp (or 1000mA as some power supplies are labeled). Bachmann trains used to come with .6 amp (600mA) power supplies, but their trains required very little juice to run, so if you stick with Bachmann, even little wimpy power supply may work for a time. Just don't expect .6 amp power supplies to drive other brands as well. In my experience, Aristo's old 1.8-amp power supplies would drive anybody's starter set trains over a railroad up to 120', but for larger trains and locomotives, a minimum of 3 amps are necessary. 5 amps is better. For running really long trains or more than one locomotive in the same train, consider a 10-amp system. Whether you want to add remote control to your railroad or not depends more on whether you tend to sit in one place when you run trains, or whether you'd rather walk around. The following table breaks down these "guidelines" into a little more detail. They are just guidelines, however. Your "mileage" WILL vary depending on the brands you buy and the kind of trains you like to run. Railroad under 60?, locomotives with 10 wheels or less, train lengths under six freight or two passenger cars, centrally located control point ? 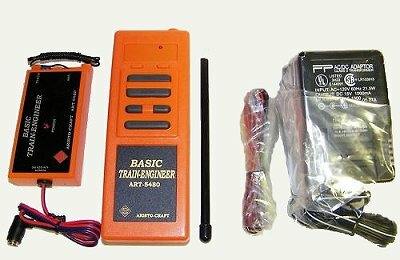 Use the power supply that came with your train set, or track down an AristoCraft/Crest 5400, which will give more reliable operation than most starter set power supplies. Upgrade to a two-piece system, such as the AristoCraft 5450/5401 or ?55460/55401 ten-amp combinations. Upgrade to a two-piece system with remote, such as the AristoCraft/Crest 55470 system or a Crest Revolution system. Railroad over 200?, multiple locomotives per train, longer trains, etc. Upgrade to a two-piece system with remote, such as the AristoCraft/Crest 55470 system or a Crest Revolution system.? Make certain your power supplies provide at LEAST ten amps. So don't be afraid to step up to the "next level" when your railroad has outgrown its existing setup. I also have friends who've experiemented with adapting non-railroad power supplies and other DIY projects. As long as you only send DC at the rated voltage or less of your locomotives, you won't hurt them, so don't be afraid to try something different. I'd be delighted to hear about or see examples of anything you've tried along these lines, even if it was a spectacular failure. In fact, maybe it's time I started learning from other people's mistakes instead of making all of my own.